Every year in my garden I grow something "random" just to see what happens. Last year, my experimental crop was quinoa. I figured the flowers were pretty and if I happened to get a harvest from it all the better. How did it go? Well, I learned that you need to have A LOT of plants to get any kind of a substantial harvest and that you'll spend A LOT of time separating seed from flower. I had about six plants which yielded maybe 3 cups of quinoa (if I'm lucky). It took pretty much all afternoon to get that 3 cups of finished product. Lots of shaking and sifting. Still it was fun and I admit that it is kinda cool to say, "I'm growing my own quinoa." I'll do it again, but now I'll have a better idea of what I'm getting myself in to. After all that hard work needless to say I've been reluctant to cook any of it. It was like I was hoarding it for a special occasion. However, the other night I threw caution to the wind and cooked some of my precious harvest! It had a great nutty flavor and I cooked it perfectly - just tender, not mushy. One important thing to note is to very, very thoroughly rinse the quinoa before cooking. 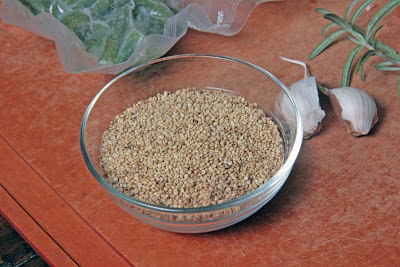 In its natural state, quinoa is coated in extremely bitter-tasting saponins. Most quinoa sold commercially has been processed to remove this coating. This bitterness is a good thing during cultivation, as the plant is unpopular with birds and other plant-munching critters. This bitterness is a bad thing when you want to eat your quinoa. For homegrown quinoa the saponins will still be there, so right before you're going to cook your quinoa, you need to rinse it under running water for several minutes in either a fine strainer or a cheesecloth. For this meal all the main ingredients were either homegrown or local. 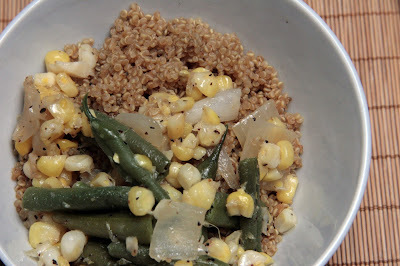 The vegetables normally would have been the star, but on this night, it was all about the quinoa. In a small saucepan over medium high heat bring the water and quinoa to a boil. Once it boils, reduce heat to low, cover and let it simmer about 10 minutes or until all the water has been absorbed. While the quinoa cooks, heat the olive oil in a large saute pan over medium heat. Toss in the onion and garlic and saute until the onion becomes translucent. Add the thawed green beans and corn. Cook until warmed through. Remove the leaves from the rosemary sprig, coarsely chop and sprinkle onto veggies. Saute for another 2-3 minutes. Season with salt and pepper to taste. Sprinkled on a pinch of crushed red pepper flakes, if desired. Divide the cooked quinoa between two bowls. Top each bowl with a few scoops of the sauted veggies and serve. Did you know even the commercially available quinoa is harvested by hand? Yes, by hand! I have a new found respect for that big bag of quinoa at the market because, trust me, a lot of labor went in to it!